Riley Thompson describes the unique way that siphonophores grow. Rather than have one body with many specialized parts, they have many bodies that are each specialized for particular tasks. For more information, see our medium post. This episode of CreatureCast was created by Riley Thompson, based on a script that we wrote together. The animation is based in part on illustrations by Freya Goetz. More animations can be found at creaturecast.org, a project supported in part by the National Science Foundation grant DEB-1256695. Music by Coda. This episode was shot in 2013 on a research cruise aboard the Monterey Bay Aquarium Research Institute’s research vessel Western Flyer. We joined Steve Haddock’s lab to collect siphonophores with blue water SCUBA diving and the remotely operated underwater vehicle Doc Ricketts. More details on the cruise are available at MBARI. The music is by Gillicuddy. A shorter cut of this video is available at vimeo. The siphonophore Hippopodius hippopus is usually transparent, but when disturbed it suddenly becomes milky white. We originally posted this episode at the New York Times, where you can read more. This episode was made by Pathikrit Bhattacharyya. The music is by Lee Rosevere, Alex Gross and Thiaz Itch. Our friend Steve Haddock at the Monterey Bay Aquarium Research Institute has posted a video called “There’s no such thing as a jellyfish.” It surveys a broad diversity of animals that are clear and squishy, and explains why there is no one group called “jellyfish”. Many different groups of animals, from stinging cnidarians to swimming snails, have independently become free swimming, gelatinous, and transparent. These little pinkish crustaceans have set up house inside the muscular pulsating swimming parts of the colonial jellyfish, Nanomia. Out in the deep sea, there are few solid structures to call home, so living things will often take shelter in or on other animals. Fish or bugs often hang around the tentacles of jellyfish because the jellies catch food there and are likely to drop pieces that can be salvaged. But these crustaceans are taking a different approach. They are living inside of swimming bells that are nowhere near where food is caught and eaten. These powerful little pods contract to push the colony through the water. The amphipods are likely to be taking refuge in the sturdy tissue, and feeding off the jellies flesh from the inside of the swimming bell. Stefan Siebert, a post-doc in the Dunn lab, took this photograph of a Nanomia that he caught on a collecting trip in California. The gas-filled gland that keeps the colony afloat is hanging off the left side of the page. Three swimming bells for jet propulsion (with one amphipod crustacean in each) are seen in the middle. The part of the colony that feeds, reproduces, protects, and more, starts in the bottom right corner of the photograph. These amphipod crustaceans happen to be very similar to the ones we just made an animation about, that live on the fried egg jelly. Here is a video from Casey Dunn of some other colonial jellyfish, to get a sense of how this close up photograph fits into the context of the whole colony, and to see how the swimming bells pulsate. This photograph, by Stefan Siebert, is released under a Creative Commons Attribution-Noncommercial-Share Alike 3.0 license. Here’s a short episode featuring Trisha Towanda, of the fried-egg jelly story. If you’ve ever wondered what a siphonophore taste like, it’s spicy. Puppetry and editing by Sophia Tintori, with slightly modified music by Anita. Sea snow from deep sea footage courtesy of Dr. Steve Haddock at the Monterey Bay Aquarium Research Institute. This video is released under a Creative Commons Attribution-Noncommercial-Share Alike 3.0 license. Last month we posted a video of a siphonophore (one of the Dunn lab’s favorite animals) swimming freely in the ocean. In this next installment of CreatureCast, Casey Dunn describes how siphonophores help us question what we think of as an individual. There are different ways to think of individuality. Individuality can refer to function- whether an organism operates and interacts with the world as a unit. A fish is a functional individual, but so is an ant colony. Individuality can refer to evolutionary descent. In this respect our liver is not an individual, there was no ancestral free-living livers out there that our liver is descended from. But our mitochondria are individuals in this sense. They evolved from free-living bacteria that became incorporated into other cells. Individuality can also refer to the process of evolution. In this sense an individual is any entity that has the properties necessary for evolution by natural selection- it reproduces and has variable heritable properties that influence the chances of survival. This could be a free living cell, a cell in a body, an entire multicellular organism, and even groups of organisms in some cases. All of these definitions of individuality are in alignment in most of the organisms we are familiar with. A bird, a rose bush, and a fly are all individuals as functional entities, according to their ancestry, and as units of selection. This makes it easy to get lulled into thinking of individuality as a monolithic property. A siphonophore colony is a functional individual. But a siphonophore colony is made up of many parts that are each equivalent to free living organisms such as sea anemones and “true” jellyfish. So by the evolutionary descent definition it is a collection of individuals. The colony as a whole is acted upon by natural selection, making it an individual in the sense of the process of evolution. But it is entirely unclear whether natural selection can act on the parts within the colony, as it does on our own cells when we get cancer, since we don’t know about the heritability between the parts of the colony. Siphonophores, by forcing us to disentangle what we mean when we call something an individual, help us understand the evolutionary origins of individuality. These different aspects of individuality don’t necessarily evolve at the same time, and one or more of them can even be lost. Organisms like siphonophores provide glimpses of these different combinations of individuality. Most of the stills are plates from the first papers describing siphonophores. They were published from the mid 1800’s to the early 1900’s by Henry Bryant Bigelow, Ernst Haeckel, and Karl Vogt. The song New Homes is by Lucky Dragons, the siphonophore video is from Dr. Steve Haddock at MBARI, the podcast was produced by Sophia Tintori, and the video is published under a Creative Commons Attribution Non-Commercial Share Alike 3.0 license. Here in the Dunn lab, siphonophores are our favorite animal and the focus of much of our research. Dr. Phil Pugh is a good friend of the lab, and he also happens to have described more new species of siphonophores than anyone who has ever lived. In the video below, he describes what it’s like to come across a siphonophore in the deep sea with a submarine. What looks like one long body in this video is actually a free-swimming colony of clones — many genetically identical bodies that are all attached. But each body in the group isn’t just like its neighbor. They each do a specific job for the colony. Some individuals will swim, some will catch food, and some will reproduce. More on siphonophore biology can be found in papers here and here. But we’ll talk about all that later — for now, just take a look. Footage courtesy of the Bioluminescence lab at the Monterey Bay Aquarium Research Institute. Music graciously provided by Raf Spielman of The Golden Hours. Edited by Sophia Tintori. This podcast is published under a Creative Commons Attribution Non-Commercial No Derivatives 3.0 license. Cnidaria is a group of animals that includes – among other things – jellyfish, corals and sea anemones. They take their name from the greek word for nettles (knide) because of to the sting and rash that a close encounter with them can cause. They elicit this response with a particular type of stinging cell that only they possess, the cnidocyte, which is arguably the most complex cell possessed by any animal. When triggered, a cnidocyte releases a hollow harpoon that penetrates prey organisms – or a swimmer’s skin- and injects toxins. These harpoons are microscopic, and there are many types of cnidocytes each with a different type of harpoon. Some create a painless sticky sensation, others are so powerful that a sting from just one cell can cause considerable burning. The siphonophores, a group of colonial cnidarians, have multiple polyps and medusae that are specialized for tasks such as locomotion, feeding or reproduction. 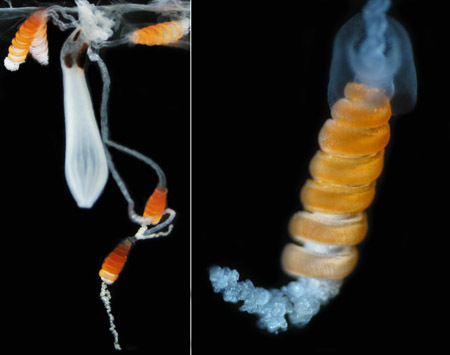 The picture on the left shows a feeding polyp (the prominent white structure in the center) of the siphonophore Nanomia bijuga. This feeding polyp is attached to the stem of the colony, which stretches across the top of this photo. Each feeding polyp has a single tentacle, and this tentacle has side branches with dense batteries of cnidocytes. Most of the cnidocytes are densely packed into a fascinating complex structure – the cnidoband. These are the orange spirals in the photos. The cnidoband ends in a filament (lower part of the picture) which contains sticky cnidocytes. The terminal filament makes first contact to the prey and sticks to it, which then tugs the cnidoband as the prey struggles. The cnidoband then stretches out and its cnidocytes fire as a unit, deploying their deadly power. 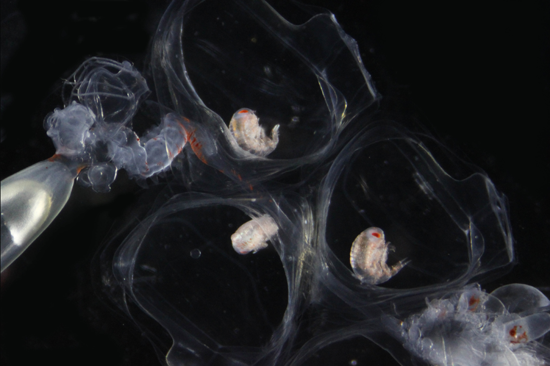 These Nanomia bijuga were collected using the ROV Ventana with the friendly support of MBARI. Photos by Stefan Siebert. With the advent of submarine warfare, the ability to locate large underwater objects with SONAR became of prime strategic importance. Active SONAR detects objects by listening for echos from pulses of sound. As SONAR became more widely used, though, some very strange things were seen in the open ocean. At times, the SONAR suggested that the ocean floor was much shallower than maps and direct depth measurements indicated. Ships sitting in one place would also find that the depth of the ocean would appear to change through the course of the day, as if the sea floor were heaving beneath them. Something was creating a false bottom that the SONAR couldn’t see through. Submarines found that they could dive right through this layer, hiding beneath it and rendering the SONAR above useless. Details about these false bottoms in the open ocean were closely guarded military secrets during World War II. It had been suspected that the false bottom was made of large groups of animals, but nets sent to this region usually came up empty. Then, in 1963, Eric Barham, a scientist at the US Navy Electronics Laboratory, reported his first-hand observations form aboard the research submarine Trieste. His dives were coordinated with ships above that monitored the position of the false bottom with SONAR. When Trieste arrived at the false bottom it did find animals, and lots of them. 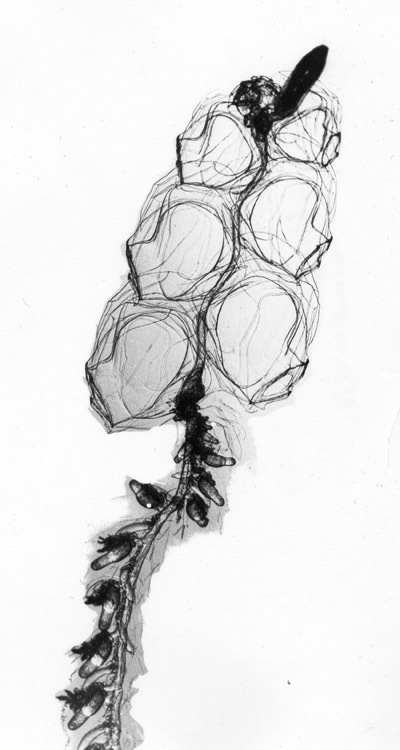 They were siphonophores, extremely fragile colonial jellyfish that are notoriously difficult to collect. They are so fragile that they usually turn to slime in nets and pass right through the mesh. How could something so delicate and gelatinous have such a strong signature on the SONAR, powerful enough to hide entire submarines? Many species of siphonophores have a gas filled float that serves to regulate buoyancy, and possibly to sense which way is up. The siphonophore that was found in the false bottom, Nanomia bijuga (see photo above), has a float that is about a milimeter in diamater, which is predicted to resonate at a frequency very close to the sound pulse used by SONAR. This resonance scatters the sound, and when there are lots of siphonophores the scattering is so thorough that the SONAR can’t penetrate through the swimming jellyfish. Besides revealing the important impacts of a poorly-known colonial jellyfish on military technology, these findings also indicate how difficult it can be to measure the abundance of jellyfish. They weren’t detected in nets sent to the false bottom, but there were enough of them to hide entire warships. This measurement problem is compounded when we try to establish whether jellyfish are rising or falling in abundance through time. Because they are so difficult to observe, their abundance has likely been dramatically underestimated in the historical record. As we see more jellyfish with improved sampling methods, it is hard to know if they are more numerous than they used to be. The Nanomia bijuga photo above was taken by Claude Carré at Villefranche. The float is at the upper right of the image. More information on siphonophores can be found at siphonophores.org.